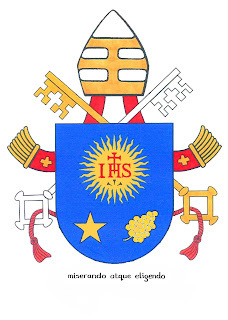 Vatican City, 19 March 2013 (VIS).- The new pontiff's papal coat of arms and motto are the same that he used as bishop. 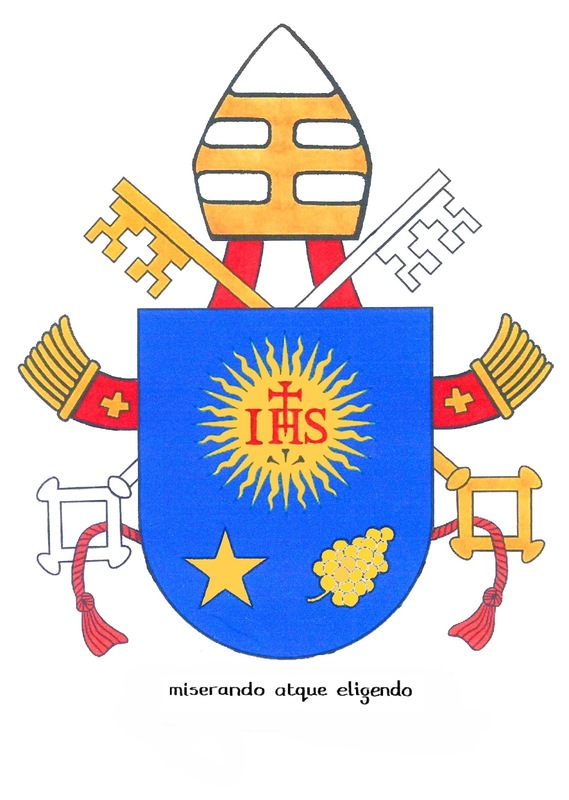 The shield has a bright blue background, at the centre top of which is a yellow radiant sun with the IHS christogram on it representing Jesus (it is also the Jesuit logo). The IHS monogram, as well as a cross that pierces the H, are in red with three black nails directly under them. Under that, to the left, is a star representing Mary, Mother of Christ and the Church. To the right of the star is a nard flower representing Joseph, Patron of the Universal Church. With these symbols the Pope demonstrates his love for the Holy Family. What distinguishes his coat of arms as pontiff is that, instead of the wide-brimmed, red cardinal's hat atop the shield, it is now bears the same symbols of papal dignity as that of Benedict XVI: the papal mitre and crossed silver and gold keys joined by a red cord.